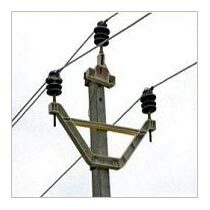 V Shaped Arm that we manufacture and supply is widely used as an electrical pole in various regions. Owing to its optimum strength and durability, our V Shaped Arm is immensely in demand by the clients. Moreover, our clients can obtain V Shaped Arm in diverse sizes and specifications to suit their requirement. We make available V Shaped Arm in bulk quantities and at nominal rates.